The quest for true love is hard and tricky for everyone, no matter where you are from. The key is to stay positive and move forward. So, if you’re from Quebec and you want to try out the online dating game, Quebec Personals is a perfect online dating site for you. 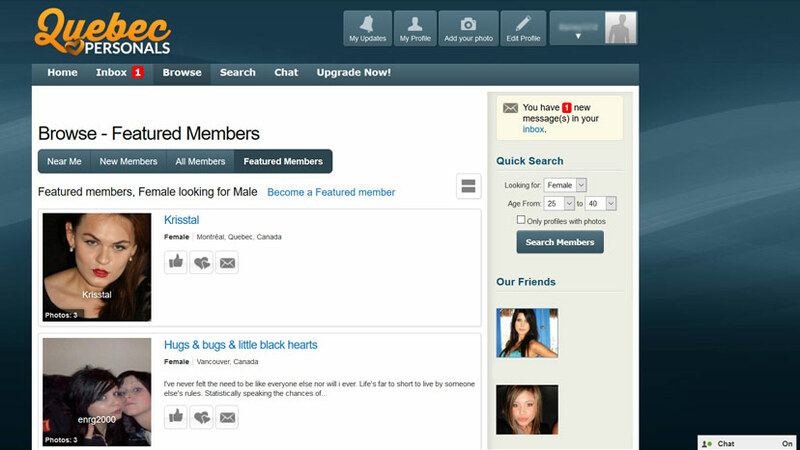 It offers its users a chance to find true love among thousands and thousands of fun Canadians. So, what are you waiting for? Take a quick tour with us to see what this online dating platform has to offer. If you are from The Great White North and you’re looking for a Canadian companion, you’ve definitely come to the right place. After the completion of a quick and painless sign-up procedure, you’ll notice that this online dating site has a standard and easy-to-use interface. Meet Singles in Quebec – Visit Quebec Personals Now! From the moment you enter, the site will start suggesting that you should upgrade your membership, upload your photo, and edit your profile right away. That is a little bit pushy, but on the other hand, the quicker you set up your profile, the quicker you’re going to find yourself a match. Other than that, it’s safe to say that this dating website is pretty simple and straightforward. Which is definitely a plus, since you’re here to quickly find yourself a good old online fun. You definitely won’t be amazed by the design of this website. We have to say that this dating site has a very simple, almost lazy design – it is completely blue with a small orange logo at the top. However, that’s still better than those flashy websites that are just too distracting. Aside from that, Quebec Personals has a very intuitive and simple interface that is filled with nicely distributed features. The most important and useful options and tools are very easy to find, so you’ll get used to this dating platform pretty fast and you’ll be able to focus on finding your next lover. While it may lack some interesting design, this dating website certainly makes up for it with a number of useful features that will help you on your love quest. Like many other online dating sites, this one also has features like Add Your Photo, Edit Profile, My Updates, and Chat. These options will allow you to introduce and represent yourself in the best way possible. Use them wisely in order to win over a fellow Canadian. Other than these, Quebec Personals has a cool search engine that will allow you to search the entire member base by using Advanced Search, Basic Search, By Interest, and By Screen Name. If you’re traveling and long distance relationships are a trouble for you, you can always check out who’s near you by using Browse option. While you’re there, you can also look up some New Members, Featured Members, and All Members. One more interesting feature is that you you’ll be able to see who liked you and who’s viewed your profile. Pretty cool and exciting. Your biggest concern regarding the member base certainly has to be the presence of fake accounts. We’re not going to lie to you, this dating site, like many others, is bound to have some of those, but you’ll recognize them right away. So, don’t worry, put yourself out there and experience Quebec’s online dating life. To be fair, this website doesn’t have the widest member base out there, but it does feature some interesting, beautiful and fun users who are looking for a new online dating experience. This online dating site like many other has its fair share of flaws and imperfections, but if you’re from Quebec and you’re into online dating, you should definitely give it a chance. Who knows, maybe this site harbors your next perfect Canadian companion. Only one way to find out.